This unit has an internal, replaceable liner intended for use with PVA glues such as a well-known one by Titebond®. The 9012's stainless steel body resists rust and corrosion better than other glue tanks, which is ideal for shops near salt water. Its rugged design stands up the wear and tear of daily use in a busy shop. The tank comes equipped with our standard glue gun, a versatile tool which can accept the full range of specialized Pizzi glue nozzles. The tank features three hose fittings, so three operators can use the tank simultaneously with the addition of another glue gun and hose. 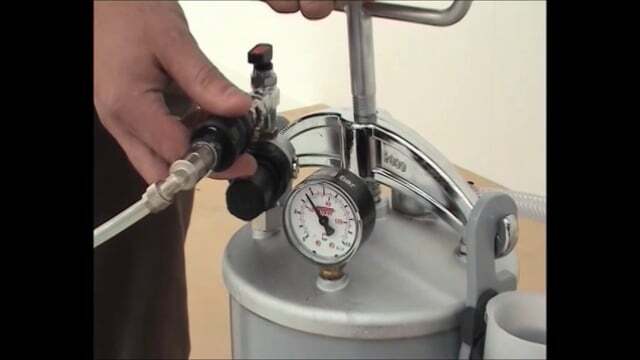 Setting your tank up is simple and quick- fill the plastic interior container with PVA glue, close and pressurize the tank to a max of 5 bar/75 psi with compressed air, and disconnect the air hose. The tank stays pressurized and ready for use for months. With our helpful maintenance guide, keeping your guns and nozzles in good condition is simple and clear.